Folks who want to make sure they're among the first to buy a Galaxy Fold (pictured above) can now reserve the phone here at Samsung's official US website. According to Samsung, Galaxy Fold supplies "will be limited." Thus, if you have the money and the desire to get the handset, you should probably reserve it as soon as you can. After a reservation is placed, you will "receive an invitation to complete your exclusive pre-order," although it's not clear when pre-orders will actually be open. Back in February, when Samsung first announced the Galaxy Fold, it said that the handset would be priced at a whopping $1,980. Since then, there's been no update regarding the smartphone's price, so we assume that this is how much it'll cost when it finally goes on sale. At T-Mobile, the Galaxy Fold will come with a free carbon fiber case and free Galaxy Buds wireless earphones, and we're guessing that AT&T intends to offer similar freebies (though that remains to be confirmed). Unlike other wannabe-foldable phones of the past, the Samsung Galaxy Fold sports an inner display that's literally foldable. Tests conducted by Samsung have allegedly shown that the flexible display of the new smartphone can survive at least 200,000 folds and unfolds without being damaged. All in all, the device can be folded about 100 times per day for no less than 5 years. You can see how Samsung is testing the Galaxy Fold in the video below. 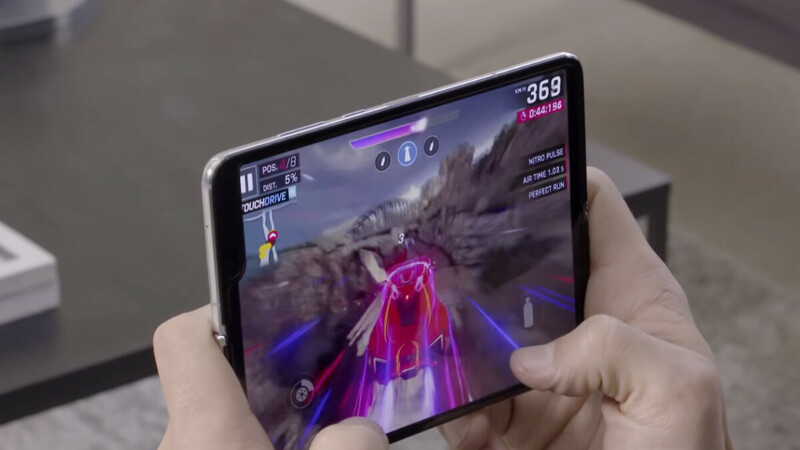 The flexible inner screen of the Galaxy Fold is a 7.3-inch Dynamic AMOLED one with 1536 x 2152 pixels - large enough to provide a great experience when playing games, watching videos and TV shows, or when multitasking. On the outside, the Galaxy Fold sports a 4.6-inch Super AMOLED display with 840 x 1960 pixels - good enough for the moments when you don't need the larger screen. Running Android 9 Pie out of the box, the Samsung Galaxy Fold is powered by a Qualcomm Snapdragon 855 processor - the same high-end chipset that you can find inside the Galaxy S10 series. The Galaxy Fold further offers 12 GB of RAM, 512 GB of internal memory, two batteries providing a total of 4,380 mAh (hopefully enough for a full day of use), a dual selfie camera, and a triple main camera with 2x optical zoom. What you will not find on the Galaxy Fold is a standard 3.5mm headset jack, but the wireless earphones that Samsung plans to give away with the phone will partially compensate for that. Another thing to keep in mind is that the Galaxy Fold is not dust- and water-resistant. Moreover, this is not a 5G phone, so the Galaxy S10 5G (scheduled for launch in May) is Samsung's only current handset that's compatible with next-generation networks. Mind you, T-Mobile and AT&T are the only US carriers that will sell the Galaxy Fold, and it looks like no unlocked version of this particular device exists. In other words, if you're on Verizon, Sprint, or US Cellular, buying a foldable smartphone is something that you'll probably not be able to do in the very near future. I want to buy this... but then again I don't . I'm not able to make decision! Please help !!!! Ask yourself these questions: what will happen if I don't buy this? Am I willing to spend almost $2k on a phone? Thanks everyone , I've decided not to buy it . Honestly cost wasn't the factor . Impracticality was . Since the outside screen is so small and I don't wanna unfold a tablet every time I need to do anything , I dropped the idea. I will surely get the next gen once the outside screen is atleast 6 inches. Ps: I prefer this design over the Mate X's . Yeah, I hear ya. This is much more refined than the huwei. I have the same thoughts on the front screen being a little small for my taste. Will wait till it has a bigger screen with s-pen support. That's why I'm at 85% still. That front screen though... But that folding screen though! Lol, did you decide yet? I think if you know you'll mostly use it for the big screen but with the versatility of the second front screen, then go ahead. It's not like the front screen is so small you can't do anything on it. I am really interested but, I just dont think I will go first generation and hopping Samsung will add the S-pen next year. If you are a true tech geek you'll get one to support are future. As a Tech geek, you would know that although having the first iteration of a product might sound and look good, it usually comes with more flaws than it's worth. Which is why it's always smarter to wait for the fine tuned follow up. I get your point of course I know that. But if no tech geeks buy one then they won't make a new one ..... :( Which means you'll buy this one and next gens . I like tech but, I never claimed to be a tech geek. Add: I like what suits me and works for me the best. I’m interested in seeing how it feels when folded in someone’s pocket. I hope the next iteration completely folds flat instead of having a Surface Book like hinge fold. And it looks thick too. Can’t find specs on Samsung’s site on the dimensions. I read somewhere that it is slightly thicker than a Nintendo Switch when folded. I plan on buying this Day 1. I think it's uglier than the Huawei one, but I like to carry one Huawei and one Samsung (for Samsung Pay) and so this looks like it will be it. If I don't like it, I'll just get something else when the next one come out. Get rid of the notch, chin, forehead and slap a s pen and then I might trade In my Razer phone 2 towards the Galaxy phone 2. Good days r coming then.. This isn’t for everyone, it’s a luxury device. The people that want will buy period, not worried about what a bill will look like lol. Those that are worried about a bill get s10s or note devices. And that will probably be me as much as I want one it's outta my league at the moment. You said it on the internet! It must be true, rich guy! LMAO Dumbest post so far. Doesn't feel like a luxury device, how many have you felt oh that's right , it's not out yet. Sweet phone but way overpriced and will be buggy for sure. Will catch edition 3.0 in a few years. 2 reasons I will pass: that horrible notch, and lower resolution main screen. You cannot reserve this for Verizon!!! WTF!!? This is total BS!! Great, so now I have to keep count on how many times I have folded this phone. Kinda feels like a car lease - counting the miles.